OhGizmo! 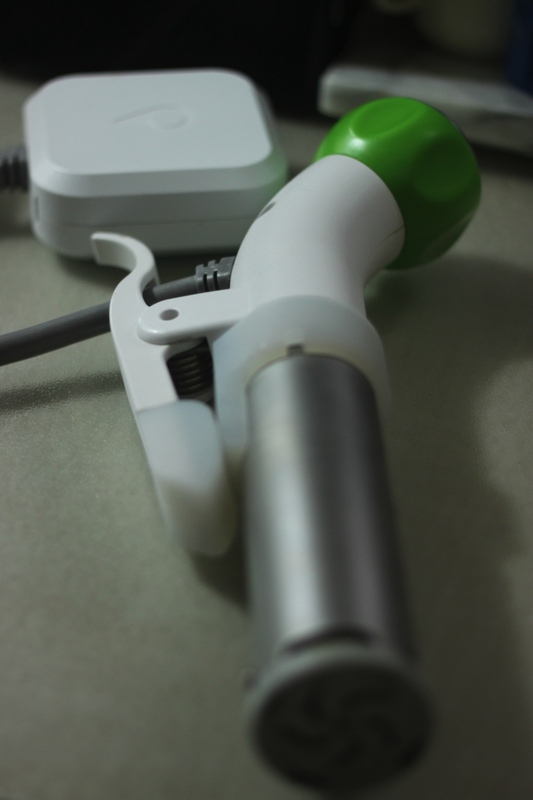 Review: The Nomiku Immersion Circulator – Tasty Sous-Vide Goodness | OhGizmo! Would You Eat Off This China? Cooking food ‘sous-vide’ involves putting it in a sealed plastic bag and immersing it under water at relatively low temperatures for long periods of time. The idea is that you can precisely control the temperature of the bath and thus achieve perfect doneness levels through and through, all the while dissolving connective tissues in meat without diluting any of the flavour. The result is supremely tender steaks, jelly-like buttery fish, and fall-off-the-bone ribs. However, immersion circulators are often very pricey and sometimes large and unwieldy machines. 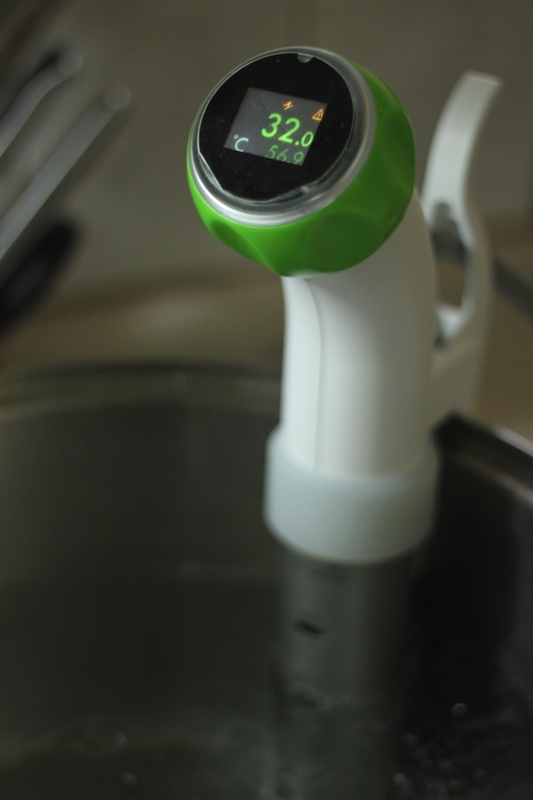 The Nomiku is none of those things: it’s a $300 clip on circulator that uses your existing pots to do its work. We’ve been testing it for the last couple of weeks and this article is a quick overview of its abilities. The Nomiku is a roughly 11 inch long tube with the upper quarter bent at a 45 degree angle. 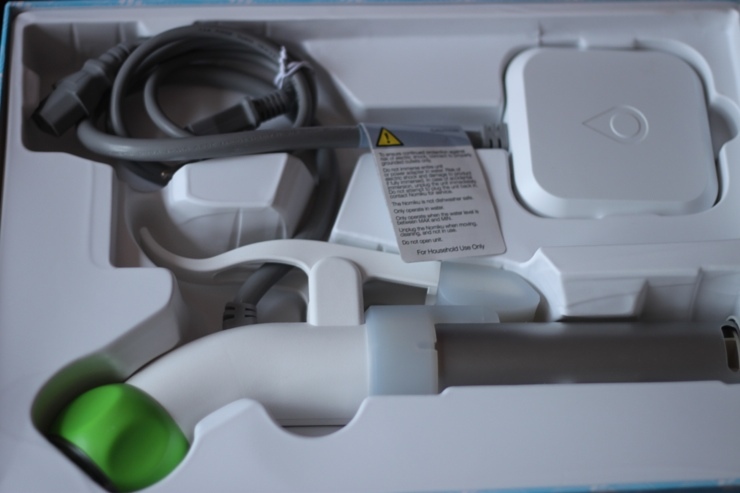 The tip is capped with a rotating wheel which you use to set the target temperature. The LCD screen is bright and adequate, although the spinning temperature wheel doesn’t provide the resistance you’d have expected at first. It works fine though. The parts that clamp on to your pots are covered in silicone and are quite grippy. The bottom contains a propeller, while the front has two small port holes to denote the maximum and minimum water levels. Finally, the power cable is thick and the transformer is quite large but tastefully designed. The device is rated at 1,200W and we’re assuming draws a fair amount of power, especially as it’s heating up a large volume of water. While it’s cooking, the Nomiku whirrs away relatively quietly. It’s much less loud than a microwave for instance, but you do hear it from 10-15 feet away. And in our testing, we’ve gone up to 29 hours of continuous use without a single hitch. The thing is robust and stands up to lengthy use. We’d say it’s a solid piece of hardware. The Nomiku is not intended to operate at boiling temperatures; most of the cooking is done between 120?F and 180?F (about 48?C and 82?C). Temperatures are precisely controlled to within 0.2?C, meaning that if a recipe calls for holding something at 55?C, the water will actually oscillate anywhere between 54.8?C and 55.2?C. That’s precise enough to cook an egg yellow without hardening the white around it, effectively cooking it inside out! It’s also well within the precision needed to output a steak at perfect medium rare doneness (134?F/56?C), or medium (140?F/60?C), or even well done (160?F/71?C) if you don’t like your steak to have any flavour. You start your cooking session by filling a big pot with water. You then clip the Nomiku to its side, making sure the water falls between minimum and maximum levels. Set the dial at the desired temperature and go prep your food while the water heats up. The thing about sous-vide is that while you’ll cook your meat just right, it’ll look pretty unappetizing when you take it out of the bag; steaks and ‘roasts’ will be dull and grey. That’s why you’ll often have to quickly sear the outside of the meat at high temperature on a skillet, just to give it that more appetizing browning. This can be done either before or after cooking, so check what your recipe recommends. And we do mean a quick sear; 20 seconds per side is often enough. You can then bag it. Either use sturdy ziplock bags or more robust vacuum sealing machines since both appear to work well. If money is no issue though, vacuum sealing is preferred. Drop the bag in the water and wait the required amount of time. This varies from recipe to recipe. It can be as little as 25 minutes in the case of salmon, or up to 24h for tougher cuts of meat. That’s to give it enough time to dissolve the collagen and connective tissue that makes the meat tough in the first place. There are a number of websites instructing you which temperature to cook what, and for how long. Nomiku’s own is BagSoakEat but a quick search will yield tons more. There are also a ton of recipes floating around with suggestions on spices and flourishes. Nomiku’s own literature provides you with about a dozen such recipes. The true beauty of sous-vide cooking however is that is shifts the emphasis of cooking to temperature, and away from time. Previously, it was important to time things perfectly. Want that steak medium rare? Stick around the grill and take it off the heat just at the right time. One minute too much and you have rubber. One minute too little and you have a bloody, chewy mess. 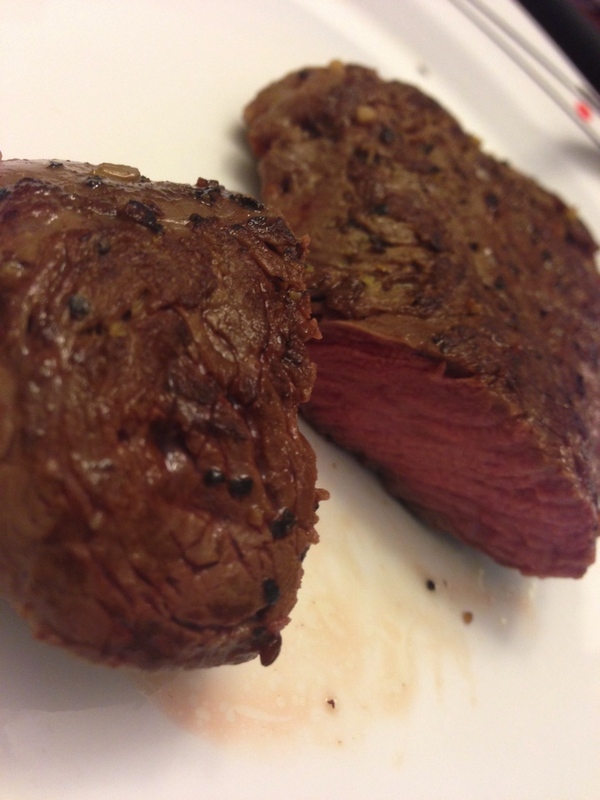 With sous-vide, you set the temperature and you know that it’ll never overcook. And while recipes call for a specific amount of immersion time, that’s really only a suggestion most of the time. Since nothing can overcook (within reason, since some meats will start degrading after a large number of hours), you can afford to be a little more sloppy with that part of the cooking. And that just makes cooking sous-vide fun and stress free. When you finally take your food out of the bag, recipes often call for saving the juices and turning them into sauces. We haven’t tried to make a sauce just yet, but we have tasted plenty of meat. And… well, there are not enough words to appropriately convey the sensations. Salmon is a highlight, turning into a jelly like substance that can be cut with a spoon. It’s buttery, and only slightly fishy. It’s wonderful. Filet Mignon steaks are cooked to perfect medium rare doneness and are so tender you could almost pull them apart with your fingers. Lamb shanks literally fall off the bone. It’s a flavour, but most importantly, a texture bonanza previously only reserved for only the most high-end restaurants, now easily recreated at home. Cooking with Nomiku is so simple and easy, and the results are so tasty and tender that we think everyone should own one of these machines, just like everyone owns a science oven (a microwave). At $300, it won’t break the bank but it’s still a large enough investment that you’ll end up wondering if it’s really worth it. Our take? It is. ← iLikey: PUSH iPhone Case is Also a Wallet–At the Touch of a Button!